Jewish, civil rights groups continue to boycott Holocaust memorial events amidst rising anti-Semitism in the government. Hungary began 70th anniversary commemorations of the Holocaust on Wednesday, amid boycotts and protests by Jewish groups which accuse the government of whitewashing the country's role in the mass deportations of Jews in 1944. Marking the day when Hungarian Jews were first placed in ghettoes in 1944, ceremonies were held around the country as part of "Holocaust 2014", a program of events organized by Prime Minister Viktor Orban's government. AFP reports Wednesday that, in Budapest, President Janos Ader and Deputy Prime Minister Tibor Navracsics lit candles at a monument by the Danube commemorating the thousands of Jews shot into the water in 1944-1945 by the Hungarian fascist Arrow Cross militia. A ceremony was also to be held at Budapest's Holocaust Museum, with trees planted and candles lit to remember the 600,000 Hungarian Jews who perished in the Holocaust. But the commemorations were marred by the absence of Hungary's largest Jewish organization, Mazsihisz, which has said it will boycott all "Holocaust 2014" events. Over the last few years, critics have accused the prime minister of turning a blind eye to anti-Semitism and of stoking a chauvinistic brand of nationalism around the country. The far-right and openly anti-Semitic Jobbik party, whose members have been accused of Holocaust-denial, has been an increasingly powerful force in Hungarian politics, finishing third in last week's election. Relations between Orban's government and the Jewish community have been especially strained over a planned monument in the capital dedicated to "all the victims of the Nazi occupation of Hungary", which Jewish groups say downplays the role Hungarians themselves played during World War Two. Orban had promised to consult the community before starting work on the monument, but construction began last week just days after the prime minister won a new four-year term in general elections. The new monument, representing a German imperial eagle attacking Hungary, depicted as the Archangel Gabriel, "is aimed at absolving Hungarians from blame for the Holocaust," says the head of Mazshisz, Andras Heisler. A group of civil organizations known as Memento70, which is planning plays, exhibits and other arts and sports events this year, has already refused to accept government sponsorship for "Holocaust 2014" events. "The government's Holocaust memory policy is simply not credible," Antonia Szenthe, a spokeswoman for the group, which includes Jewish and non-Jewish associations, told AFP on Wednesday. "We're trying to raise funds through private donations instead," she said. 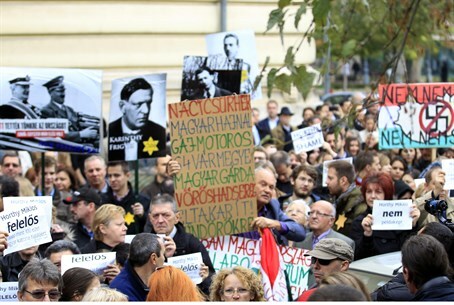 Miklos Horthy, Hungary's anti-Semitic leader at the time of the Holocaust, was an ally of Hitler and actively complicit in the mass deportations of Jews to Nazi death camps in 1944, which resulted in the murder of around 450,000 Hungarian Jews. Meanwhile, commemorations continued across Hungary Wednesday despite the protests. At a ceremony attended by survivors at Budapest's Holocaust Museum on Wednesday, the names of 1,494 recently identified Holocaust victims were to be added to the Memorial Wall. In the southern town of Hodmezovasarhely, the local synagogue was running an exhibit dedicated to Jewish athletes who were killed, with personal effects and pictures of famous sportsmen and women on show. Dozens of memorials and cultural events are planned, although the program has suffered from many organizations pulling out due to the stand-off with Orban. Around 600,000 Hungarian Jews perished in the Holocaust after Nazi Germany's invasion of Hungary on March 19, 1944, either in forced labor camps or after deportations to Nazi death camps. Only around 100,000 Jews survived, mostly in Budapest.